BONAS (BOmb factory detection by Networks of Advanced Sensors) is a Collaborative Project financed under the Security theme of the Cooperation Programme of the 7th Framework Programme of the European Commission. The BONAS project (Contract number 261685) started on the 1st of April 2011, and will have the expected duration of 3 years. A total of 12 partners participate in this project based in 9 different European Member States. The aim of BONAS is to design, develop and test a novel wireless sensors network for increasing citizen protection and homeland security against terrorist attacks, in particular against the threat posed by IED devices. The sensor network will focus on the detection of traces of precursors used in IED production (particulates, gases and/or waterborne) present in the environment surrounding the vicinity of a “bomb factory”. The different sensors are specifically designed to be deployed in sensitive locations and easily camouflaged. This network will support the “factory’s location”, allowing an early threat thwart. A feasibility study will assess the usefulness and potential advantages that the BONAS concept will bring about in the future and the costs of mass production of sensor networks integrating COTS components. BONAS intends also to investigate and prepare the potential future deployment of key sensors aboard a flying platform with a view towards increasing the BONAS network detection capabilities. The wireless sensor network will feature a variety of sensing devices (in-situ and remote), that will jointly provide broad chemical spread and low false alarm rates through an expert system management of the data collected. 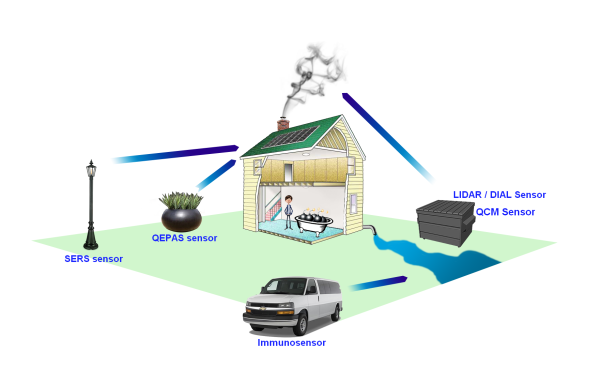 In particular, BONAS will develop: Lidar/Dial system; QEPAS sensor; SERS sensor; QCM sensor, and Immunosensor. BONAS includes a multidisciplinary team of leading European research groups together with industrial organizations and end-users with previous experience and activity in the field of specific local and remote sensors development and with experience on Security projects. The consortium represents the complete supply chain of the proposed product, which sets good perspectives for exploitation and commercialization of the generated innovations. The consortium will be supported by an already established Advisory Board formed by experts from the main European and Israeli police corps. Disclaimer : Project BONAS is funded under the 7th Framework Programme of the European Commission, grant agreement no 261685.